Have fun making great brackets and win Starbucks and Amazon cards from Chooszing! Download Chooszing from Apple and Google Stores. 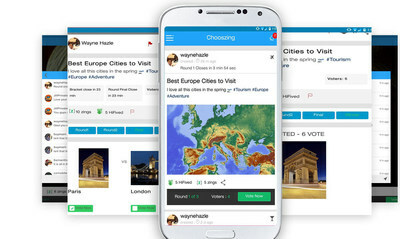 BURBANK, California, Feb. 10, 2018 /PRNewswire/KOREA IT TIMES -- Chooszing, the app that lets users create, vote on and share brackets about things you love™, is sponsoring its first online bracket making-contest in honor of the Winter Games in Pyeongchang, South Korea. Chooszing was founded by Wayne Hazle in 2015. Wayne Hazle says, "People enjoy making tournament brackets around certain sporting tournaments, like the March Madness NCAA Basketball Tournament. But I also see people like voting in brackets on almost anything, from the best restaurants, scariest horror movies to the most gorgeous shoes. I realized this would be a fun activity in a mobile, social network environment. Thus, Chooszing was born with the mantra, 'Tournament brackets on anything and everything™'." "We have been looking forward to this promotion. The Olympic Games are a worldwide phenomenon and we will be excited to see Chooszing users all over the world having fun, voting in and commenting on great brackets," says Wayne Hazle. "There are few African Americans heading a social networking company, and I am thrilled to be joining this space." Chooszing is a fantastic platform for social network influencers to promote their own brand and interact with their followers. We are thrilled to be working with world traveler and lifestyle blogger Sarah Funk (www.sarahfunky.com) during the Games. She will be creating exciting brackets related to her interests. Follow Chooszing on Instagram, LinkedIn, YouTube, Facebook, Twitter and Tumblr. Each day of the games you can make a bracket and win a prize.